Mariposa's Tales MARIPOSA'S TALES: 1, 2, 3 and Smile! I think birthday parties were made for us to enjoy the excitement in the children's faces. Great take on the theme! This was a tough one but yours was just right. Haha if you can't get jiggly on your birthday when can you? Great take on the theme! LOL! Perfect for the theme, this week! Very jiggly, indeed! 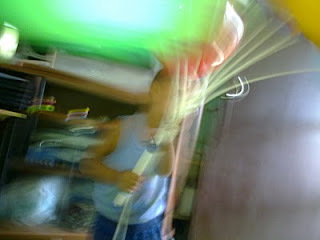 Who could hold still with a balloon at hand? Nice! Thanks for dropping by.